Do you feel like there’s just not enough light in your living room to comfortably read a good book? Do you struggle with reading the newspaper on the weekends because your living room isn’t well illuminated? If you answered “yes” to any of these questions, there could be an imbalance between the task lighting and the ambient lighting in your home. When you have a thorough understanding of these two lighting types, you can use them effectively to help bring harmony to the lighting in your home. At M&M Lighting in Houston, we’re proud to offer the best interior lighting solutions including lamps, pendant lights, and recessed lighting from some of the best manufacturers around. We carry an assortment of Kichler, Murray Feiss, and Maxim lights in a variety of styles and finishes and we would love to help you find the best lighting solution for your home. Contact the lighting experts at M&M Lighting today to learn more about our impressive selection of lights! While you may not think of each room in your home as its own entity, you might be surprised to learn how much lighting can affect your productivity in each space. While some rooms in your home are used for relaxation, such as your bathroom or bedroom, others may be used for working or paying bills. The activities you partake in in each room of your home helps define its overall function, which can be a big help when it comes to choosing light fixtures. That’s where task lighting comes in! Task lighting is often used to help facilitate a particular visual task. 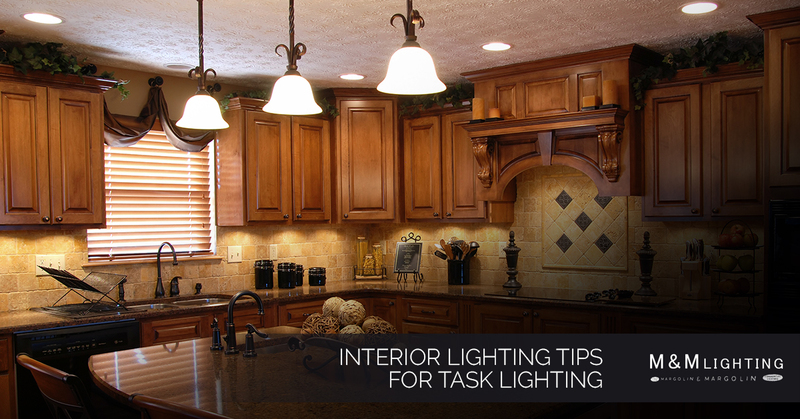 Whether you’re chopping vegetables in the kitchen or sending emails in your home office, task lighting will help you clearly see the activity at hand. Unlike ambient lighting, which is used to warm up rooms in your home through subtle light fixtures, task lighting can take on many different forms. From desk lamps to track lighting and fluorescent fixtures, task lighting efficiently distributes light in the areas that you need it most. If you need assistance choosing the best task lighting solutions for your home, contact the lighting professionals at M&M Lighting today. The bedroom is where you start and end your day. This room serves a unique function in comparison to the other room in your home because it provides you with a place of relaxation and functionality. Some people enjoy reading before they go to bed, and if you’re one of those people you probably have a desk lamp on your night stand for illumination. Another great way to equip your bedroom with task lighting is to install wall sconces above your headboard. With the large selection of wall sconces available on the market today, it’s easy to find a light fixture that matches the interior decor of your bedroom. If you need assistance choosing the best wall sconces for your home or bedroom, contact M&M Lighting today. We offer a variety of finishes and styles and we would love to help you find the best lighting solution for your home. While your bathroom is a place of relaxation, task lighting should be considered near the vanity to assist in your morning preparation. Many homeowners make the mistake of placing a recessed lighting fixture above the mirror or purchasing a vanity with built-in overhead lights for their bathroom. The best way to balance the vanity lighting in your bathroom is to place vertical light fixtures on both sides of the mirror (this will also help you get rid of unwanted shadows). Each light fixture should be installed near eye-level, and you can even throw in dimmer controls if you’re afraid of the light being too bright. When it comes to your bathroom shower, a single recessed lighting fixture should provide you with the proper amount of light for your bathing needs. At M&M Lighting, we offer a large collection of high quality recessed lights and bathroom light fixtures to help improve the illumination of your space. Contact our lighting professionals today to learn more about our bathroom lighting solutions! While your living room should feature ambient lighting, it’s important to ensure you make room for task lighting as well. Many homeowners utilize floor lamps, desk lamps, and wall sconces in functional areas of their living room so they can read and write. Whether you place a floor lamp near your weekend recliner or a desk lamp on a side table, these subtle fixtures will help you focus on the task at hand. The lighting in your kitchen is very important, especially if you love to whip up meals for the family. With a carefully planned kitchen lighting system, you’ll be able focus on cooking your favorite meals at maximum efficiency. Most kitchen lighting systems utilize a combination of both ceiling light fixtures and under-cabinet lighting. For key work surfaces of your kitchen, recessed lighting can go a long way when it comes to highlighting high-traffic areas. Fluorescent bulbs are extremely energy efficient and will give you the most light per watt. Halogen bulbs offer warm color tones but tend to be a little more expensive and can be hotter in temperature. Xenon bulbs have high color rendering and can last between 5,000 to 10,000 hours. 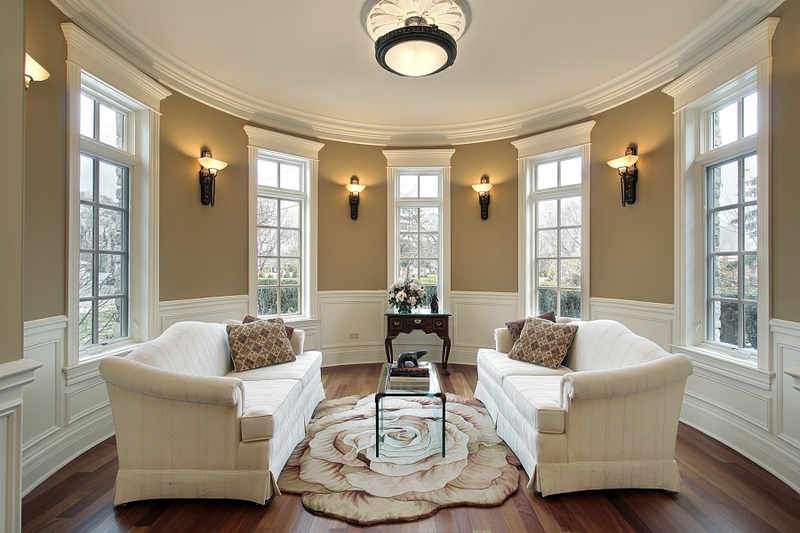 At M&M Lighting, we love helping our customers find the perfect lighting solutions for their home. If you need help choosing the best recessed lighting or light dimmers for your home, contact our lighting professionals today. We’ll take the time to understand your unique lighting needs before recommending the best light fixture for you. Browse our online store or give us a call!